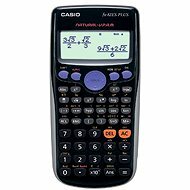 The Casio FX-220 PLUS is a basic scientific calculator that is perfect for secondary school and university students - offering 181 integrated mathematical functions that cover almost the entire range of studied material. Make calculations, fractions, permutations and combinations, as well as hyperbolic functions, statistical calculations, and much more. The Casio FX-220 PLUS calculator has a ten-digit display, which is divided into two lines, for better application of some functions. It is powered by two AA batteries. The Casio FX-220 PLUS also comes with a nice hard plastic cover that protects against any mechanical damage. Scientific - allowed for final graduation exams Done! Protective case, Automatic turn-off Done! Trigonometric functions Sin, Cos, Tan, Cotg, Fractions, Logarithmic functions, Calculations in DEC, BIN, OCT, HEX, PEN, Calculations with matrices and vectors, Statistics of two variables Done! Casio is a Japanese manufacturer of electronics and electronic equipment. Its history begins in 1946 in Tokyo. The company was originally a manufacturer of calculators, leading the field throughout the second half of the twentieth century. The company has expanded a lot, offering watches and audio equipment in addition to calculators. 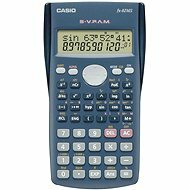 For shipping to other EU countries visit this page Casio FX-220 PLUS. Chcete doručit zboží do Česka? Prohlédněte si CASIO FX 220 PLUS. Chcete doručiť tovar na Slovensko? Prezrite si Casio FX 220 PLUS. Magyarországra történő kiszállításért tekintse meg ezt a termékoldalt: Casio FX 220 PLUS.